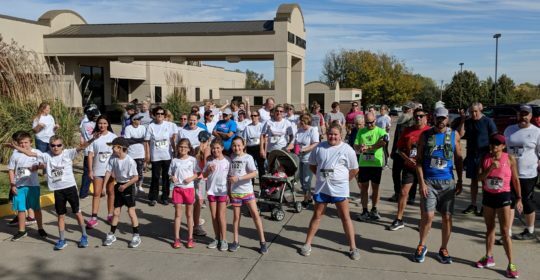 On Sunday, October 21, 2018 Meade District Hospital hosted their 2nd Annual 5K for Breast Cancer Awareness. The event was designated as a Fun Run/Walk/Team Effort to encourage all ages and athletic abilities to participate. And that sure proved true as all ages joined in the event! Everyone who supported and participated in the event! LaDonna Trujillo and the MDH Employee Association for sponsoring and organizing the event! Meade Ace Hardware for donating supplies! Meade Police Department for providing traffic control! Congratulations to all of those who placed in their divisions! For anyone who was unable to participate in the event but would like to support this cause, you still can! Donations can be mailed to Meade District Hospital, P.O. Box 820, Meade, KS 67864 or dropped off at the hospital registration desk. Just make a note it’s for the “digital mammography fund”. Thank you!